May I Freshen Your Documentation? 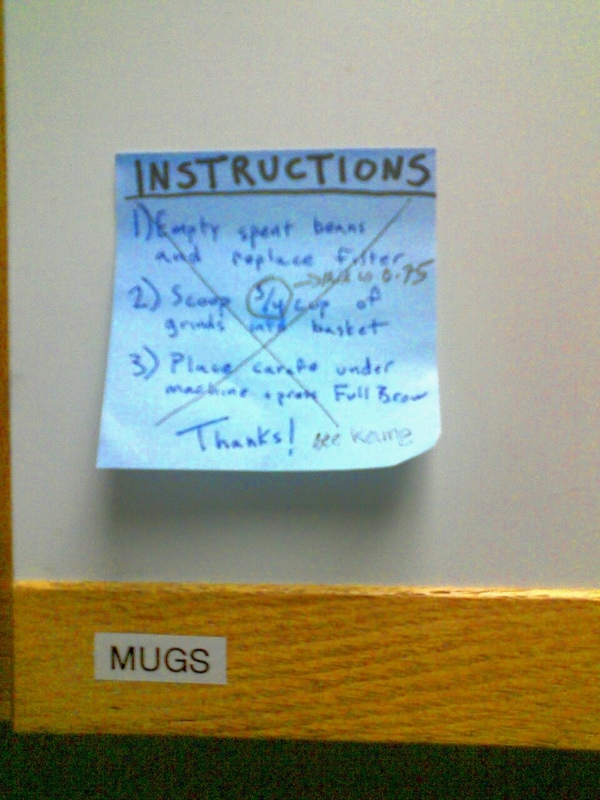 There’s a post-it on a cupboard at work that explains how to make coffee. I wrote earlier about how these instructions were modified to convert the measurements to decimal. The coffee maker was recently replaced with a Keurig pod brewer. The only thing to measure now is the size of the coffee cup. No more scooping; just pop in your pod in push the button. So we can toss the instructions now, right? Wrong! As developers it is our responsibility to update documentation! I see the Keurig. Now what? All of the previous text has been commented (crossed) out, and “see Keurig” has been added to the document. Good job, developers! Keep documentation relevant! This entry was posted in Atomic Entry, Work and tagged climate, coffee, humor, instructions, work by retrozombi. Bookmark the permalink.